As a multiple winner of the World’s Leading Luxury Lodge, we know exactly how to look after our guests at our exclusive game reserve. Thanda Safari’s warm, attentive team attends to your comfort and needs at our three superb properties, frequently showcased in the media. 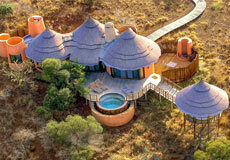 Thanda Safari Lodge has nine bush suites, personifying luxurious exclusivity and African abundance. Villa iZulu offers complete privacy, elegance and indulgence. 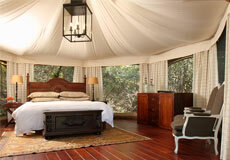 Thanda Tented Camp, with its 15 luxury safari tents, offers an evocative into Africa experience. Step out onto your wooden deck. Take a dip in your private plunge pool. Enjoy dinner served in your own private boma. 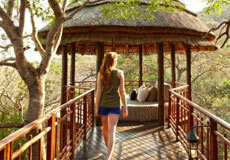 Or admire the African sunset from the circular daybed atop your thatched outdoor sala. The word zulu means ‘heaven’. The Zulu people, amaZulu, are ‘the people of heaven’ and their home, KwaZulu, is ‘the place of heaven’ on which this luxury lodge is located. Thanda Tented Camp offers an authentic safari adventure with 15 luxury safari tents in an evocative bush setting, enhanced by flickering firelight and lanterns guiding your way at night. This is bush living as nature intended: open and inviting with unparalleled closeness to the bush, its sights, smells and sounds. Each of the tents has a private sun deck and en-suite canvas bathrooms. The shared areas include a large rim-flow pool, a spa tent, atmospheric Hemingway-style lounge and dining area featuring authentic African artworks. Beautiful nature and jaw-dropping scenery enhanced by flickering firelight from the boma and warm paraffin lanterns to guide your feet along the walkway. To add to the genuine bush atmosphere, the camp is non-electrified. All decorated in rustic natural shades and complemented by the rich, warm hues of the African sunset. Villa iZulu was voted Africa's Leading Luxury Villa at the World Travel Awards. This luxurious Afro-chic homestead features five beautiful suites and includes a heated swimming pool, wine cellar, library, games room and a spacious viewing deck overlooking a water hole. It’s the ultimate safari hideaway for guests needing total privacy or for families, friends and meetings. Villa iZulu has its own helicopter pad and separate accommodation for childminders and VIP security officers. The shared area comprises a large rim-flow pool surrounded by loungers and umbrellas. Ther are 14 spacious tents, each with a private sun deck and en-suite bathroom. Ther is limited solar and battery power. Glowing lanterns will guide you along the walkways. An additional bed can be added, for one child only, at Thanda Tented Camp, however only children 6 years and older are permitted in the tented camp. Thanda Safari Lodge has 9 beautiful and spacious bush suites, each positioned to offer maximum privacy. Built to resemble the shape of a traditional Zulu homestead, the 220m² suites have panoramic views of the surrounding game reserve. Each suite features a private wooden deck and plunge pool as well as a thatched outdoor sala where you can enjoy some quiet time. Beds can be set up in the bedroom suites for an additional two children. Exclusive Use Villa iZulu at Thanda Safari Lodge: With five Luxury en-suite bedrooms, accommodating a maximum of 10 guests, Villa Izulu is equipped with a private boma, library, cellar, business room with internet connectivity, games room, heated swimming pool and magnificent viewing deck looking out onto a waterhole often visited by the Big Five. 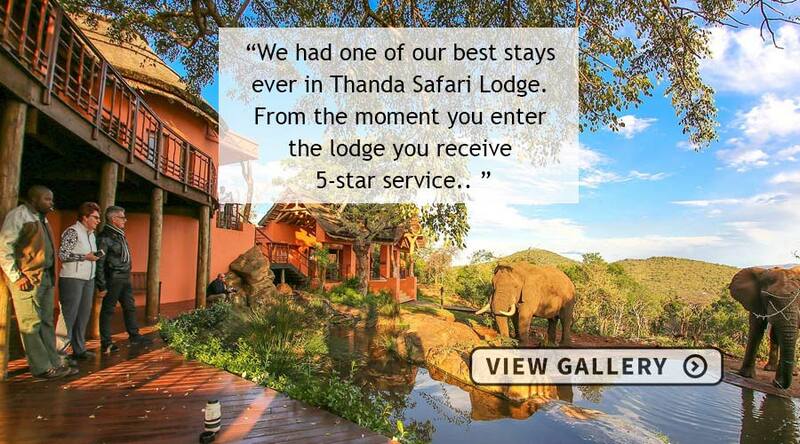 Children aged 6 years and older are welcome at Thanda Tented Camp. Children aged 6 – 16 years pay less 50% when sharing a tent with 2 full paying adults. Children aged 6 – 16 sharing with parents sleep on stretcher beds. Children aged 2 - 16 years pay 50% of the adult sharing rate when sharing with 2 full paying adults. Only one child under 16 years can be accommodated with 2 adults. Additional accommodation required for 2 or more children. Children aged 17 years and older will be charged normal adult rates. Children under 2 years will be free of charge and cots can be requested. 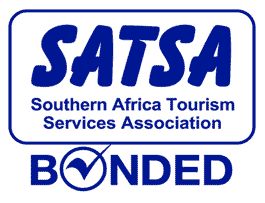 Children under 3 years are not allowed to dine in the boma, dining room or on the decks. A private boma experience may be requested for families travelling with children under 3 or alternatively, room service dinner & a child minder can be arranged. Sporadic to no MTN signal at the tented camp.